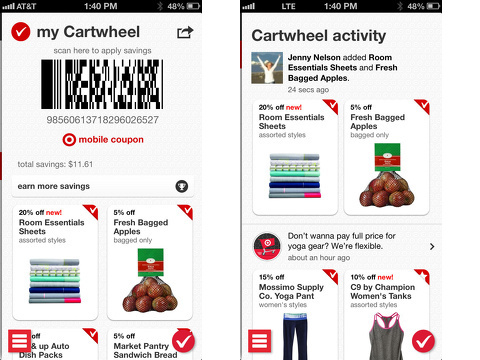 The Cartwheel by Target iPhone, iPod Touch, and iPad app creates a custom barcode for deeper discounts on your favorite purchases at Target. You can check out categories and curated collections, as well as enter custom searches, to build your Cartwheel on your iOS device. When you check out, you simply show the attendant your bar code in your Cartwheel iPhone or iPad app, and your final bill adjusts to reflect the discounts. The Cartwheel iPhone app is a free download from the iTunes App Store that leads to additional savings. Typically, products are reduced by a percentage like 5%, 10%, or even 20% for a period of time. You can combine the Cartwheel savings with some additional promotions, but there are specific limits to the number of Cartwheel discounts you can use. You must sign in with Facebook, and you are assured the following: “We’ll never post anything without your permission.” The Facebook authorization requires access to basic profile info and list of friends. There is a second pop-up where you authorize posting on your behalf to your Facebook Timeline. This could still be an effective tool to get customers in the door, if email accounts were permitted too. 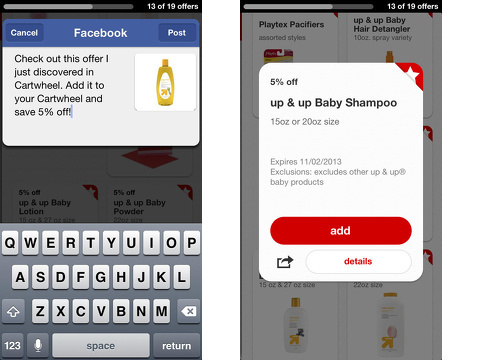 Be aware coupons added and badges earned are listed in the Notifications screen in the Cartwheel iPhone app. When Facebook friends join and use it, you earn badges. The badges and gaming-style elements do not make the Cartwheel iPhone app any more compelling than saving money at check-out. You navigate the feeds of the Cartwheel iPhone with the sliding left menu. You move between my cartwheel, activity, badges, browse, collections, notifications, help center, feedback, and settings. The most important screens are my cartwheel, browse, and collections. My cartwheel is your custom bar code with a matrix of the discounts you have added. The collections icon shows offers grouped in seasonal and compelling lists – Turkey Time, Best Sellers, and corporate-supported lists like Baby Essentials by Playtex Baby. The browse icon leads to a list of categories and subcategories. After you tap a category, a matrix of selections with one-touch filter options appears – trending, newest, expiring, and discount. For each promotion, there is a neat thumbnail with percentage off, name, quick details, photo, and friend who may have redeemed it. You touch the item, and it flips to show the fine print. You can share the deal to Facebook or add to your Cartwheel. Certain personal care items that would normally involve discretion are privately added to your Cartwheel and do not show up in the notifications screen. The Cartwheel iPhone app incorporates a couple of Android-inspired features. There is a line icon in the lower right corner of the screen, and it is the back button. The check icon in the lower right corner automatically takes you back to your Cartwheel code. These features are helpful – particularly to less savvy users like your Mom. The Cartwheel by Target iPhone, iPod Touch, and iPad is a cool way to save money, and it doesn’t involve newspapers, cutting coupons, printing coupons, and all of the other work of paper coupons. AppSafari review of Cartwheel by Target was written by Jenni Ward on November 13th, 2013 and categorized under App Store, Free, iPad apps, Productivity, Shopping, Social, Universal. Page viewed 4574 times, 1 so far today. Need help on using these apps? Please read the Help Page.